Melissa here with you again and I’m sharing my third, out of four, project using the gorgeous September Sundance kit! I hope you are enjoying this kit as much as I did and are creating lots and lots! How can you not with such beautiful product and amazing inspiration from our team? Yay! Today I’m sharing a relatively easy card to make. I just had fun with this one. No fancy design notes. No frills or extras. I just took it back to basics with this card and had fun. I went to a design that I’ve used many times on my cards… because I love it… and because it’s such a versatile one to boot. Essentially, I create half of the card with patterned paper, a diagonal slope, and minimal embellishing. Those florals are so easy to use! I also threw in some of the washi tape from the 1 Canoe 2 collection. While these papers are from the Fancy Pants collection, I wanted to show well all of these collections and kit items go together. Love it! I did use a few things from my stash. The gold enamel dots are from my stash and I used two stamps that were from past kits or sponsors. You can also find them in the store… I used a set from Latina Crafter and Honey Bee Stamps. They are no longer in the shop but, you can go check out the individual manufacturers to see all the wonderful product they have! How fun is that acrylic heart? They are included in the kit and so perfect for that finishing touch! Categories: Study Hall | Tags: 1 canoe 2, Cardmaking, Cards with Melissa, Fancy Pants Designs, Melissa Elsner, September Kit, studyhall, Sundance | Permalink. Melissa here with you again and I’m sharing the second, of four, projects I have made using the stunning September Sundance kit. I love Locker Room posts! The title always reminds me of half time at a football game (totally appropriate right now since it’s football season GO HAWKS!) and the coach is getting every one fired up again… whether it’s because the team needs a kick in the toosh or maybe they are rocking it out and don’t want to lose steam. So… this type of post always has me wanting to give you a pep talk! Maybe you have no mojo… maybe you are going strong… whatever it is, I hope that I can just provide with a couple more tools for your creative toolbox and how to make the most of your kit! I know, I know. This looks like the makings of an Art Studio post but, it’s not. This piece of cardstock was a booboo. I messed up with my ink for another project. Almost threw it out but, noticed the colors went perfect with the papers in this kit. So, I added a few more splatters and decided to use it as my cardstock base. See? Even our “mess ups” end up useful! Don’t throw them out just yet! Alright, so this next part has a lot to share. One of the ways I love taking on a new perspective and/or stretching my product is to look at what I can fussy cut. The flowers and leaves were so perfect to do this with! It definitely helps to utilize every single part of the kit. I also wanted to incorporate one of the cut files. I love how cut files can add more to the projects and, the best part? You never run out! I’m also going to be using some of the stickers on this card and those fun alpha stickers. I want to point out something with this card, so far. When I use mists and inks on my cardbase, I notice that I use less product. Why? Because the inks provide a couple of things… texture and color. That way, I can bring in a little pop of something with the pattern papers and embellishments but, not too much. The result is my product/kit lasts longer! And I can make more! Which is exciting when I love the collection and papers and all that! Yay! Thanks for swinging by today! Head over to the shop to see more of the September Sundance kit, as well as, the ala carte shop for all the beautiful add-ons you can get! Use code melissa10 at checkout and save 10% on your order! Categories: Locker Room, Uncategorized | Tags: 1 canoe 2, Cardmaking, Cards, Cards with Melissa, cut file, cut files, Digital Die Cuts, Fussy Cutting, Locker, September Kit, Sundance | Permalink. Melissa here with you today with my last cards created using the beautiful June Aquarelle kit. This is a Locker Room post which, for me, dreams up half time. You know, it’s the Super Bowl and the teams are playing their game. Maybe one team just needs that extra pep talk to keep the energy flowing. That talk may contain some new inspiration that keeps the game fresh. So, that’s what we’re doing today. June is drawing to a close and the July kit is ready for you BUT, I know you still have some scraps and leftover embellies to use. So, let’s have a pep talk and I’ll give you some fresh ideas for how to use them all up on a card. Alright, to see all the ideas and tips on how I created these two cards, I want to invite you to check out the Cards with Melissa video below and happy creating! Categories: Locker Room | Tags: aquarelle kit, Cardmaking, Cards, Cards with Melissa, Cocoa Vanilla Studio, Cocoa Vanilla Studio Wild at Heart, June 2017, Melissa Elsner, scraps | Permalink. Study Hall: Let’s Get Dazzled! Melissa here with you today and I’m sharing a card using the June Aquarelle Kit. For this card, I wanted to highlight the awesome Shimmerz Dazzlers you can get as an add-on from the shop. This stuff is so much fun! It’s, essentially, modeling paste that already has the color and lovely sheen to it. I just love how the Dazzlers give this card a little “oomph” for the background. What I did was super simple – I used a mask that I had in my stash and smoothed the dazzlers over it with a palette knife. I was careful to not leave it took think but still have enough dimension. I also love the messy look in which it seems as if I scraped off some of the Dazzlers off. It didn’t take long to dry so, I was able to complete this card rather quickly. At least, quickly when I think of how long modeling paste can normally take to dry! While it was drying, I begin to layer the top part of my card. I used bits and pieces from the patterned paper, the vellum and die cuts. I even broke out the sewing machine and added a little bit of stitching. I hope you enjoyed this card today. And, I hope you get a chance to go dig around in the shop for add-ons. While June is winding down, I know many of you are just now digging in to those June kits. Don’t forget to use up the scraps to make a few fun cards, too! I’ll be back next week with another card and the fabulous Dazzlers!!! Categories: Study Hall | Tags: aquarelle kit, Cardmaking, Cards, Cards with Melissa, Cocoa Vanilla Studio, Cocoa Vanilla Studio Wild at Heart, June 2017, Melissa Elsner, Shimmerz Dazzlers, Shimmerz Paints, stitching | Permalink. Melissa with you here again and I’ve got another card to share with you, today, using the beautiful May Sorbet Kit! Today, I want to help you think “outside of the box” a bit. 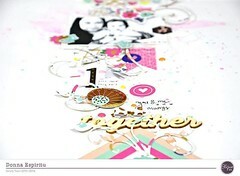 When I saw this sheet of lovely paper, from Pinkfresh Studio, in the kit – I knew I wanted to utilize it on a card. I could go the typical route and cut out a square, or two, to layer and create a sentiment. However, the more I thought about, the more I wanted to see how much I could pack on a card. A standard A2 (4 1/4″ x 5 1/2″) sized card. So, I busted out the scissors and got snipping! And snipping! And snipping! “This is very therapeutic”, I thought! And, I the design was beginning to take shape in my brain. I got pretty excited to showcase how to use all the little bits in your kit and to make it go farther! Then, the next step came. How can I dress this card up more and keep using up all the awesome items in this kit??? We have those awesome buttons and all the gorgeous ephemera. Oh… this could get fun! So, I stuck and I layered and put. Yeah??? How fun is that? I managed to include just about every color and imagery from this collection. Which, I was really happy about because I really love all the designs with this paper collection. It’s so pretty and light with a nice mod twist to it. So fun! This kit is SO fun! And I just know you are going to create and create and create with it. Don’t have one yet? Well, allow me to send you to the right place to get your own May Sorbet Kit! <—just click on that link. And, I do hope that you enjoyed my post today! Happy creating! Categories: Locker Room | Tags: buttons, Cardmaking, Cards, Cards with Melissa, Fussy Cutting, Locker Room, may 2017 kit, May Sorbet Kit, paper piecing, pinkfresh studio | Permalink.